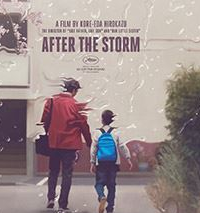 A washed-up novelist turned private detective, Ryota, mourns his father, battles a gambling addiction and tries to get closer to his semi-estranged young son in Hirokazu Kore-eda’s After the Storm. After the Storm is not necessarily a bad film, but I would not call it a good film. It is adequate, but it feels like it is less than the sum of its parts. It’s a drama, but isn’t particularly poignant or emotive. After the Storm feels like it is holding back; it’s as if the whole film is on Xanax. Xanax is great if you are having a panic attack, as it dulls the senses, but it isn’t great for a movie. The audience gets an honest, relatable glimpse at middle age after a divorce. Life is a sad struggle. It’s difficult to pay child support while maintaining a life, battling a gambling habit and mourning your father. Ryota wants to be there for his son because he will always be Shingo’s father; but it’s harder to do when his ex-wife is seeing someone new and won’t let him see the boy because he can’t pay child support. Ryota does not give up. He doesn’t hold his head high, but he keeps himself in motion, working towards getting his life back on track. The sleepy pace and muted colors of After the Storm give emit the feeling of a rainy afternoon. Hirokazu Kore-eda does a great job directing the film; each frame is eloquently composed. The movie doesn’t have much music; it’s a very quiet film, which adds to the overall drab feeling. The film is a decent 3 of 5 stars.